In a word: You'd think they were slow if the food wasn't so darned good. Addie ate a blueberry pancake with an orange juice. Barbara ate 2 eggs over easy with wheat toast. Darby ate the huevos rancheros with mint tea. Dave ate the Cho sandwich with a coffee. JM ate the 3 French toast and a chocolate milk. Livi ate the grilled ham and cheese sandwich with a chai. Nichole ate the 2 eggs scrambled, hash, raisin toast, and coffee. Robert ate the apple nut pancake, bacon, and coffee. The bill was $55, or $6/person, plus tip. Darby and Nichole gave Willalby's Cafe an A; JM gave Willalby's Cafe an A- (see our grading rubric). We invaded Willalby's with a party of 9 at noon on a Sunday, a challenging proposition for any place but especially for somewhere as tiny as this Williamson Street diner. They were also down to one cook for the day. We were impressed with how well the staff juggled everything (and it may have helped that parts of our party are regulars) - they were very up front. They told us it would be an hour to get our food, and it was slightly less; they kindly shifted some regulars from the big table in front to the counter to accommodate our horde; and through it all they kept their composure. The only hiccups were that coffee and water refills were scant, and two of our meals came out a good 10 minutes after the first seven - but that's splitting hairs. All in all, lunch was awesome. The pancakes* spill over the edges of their oval plates. The more ingredients one adds, the better the cakes get - in other words, it's worth the difference between $3 and $4 to get something fancy. Joshua started strong but after a while his huge plain pancake elicited an "uggg, too much food." Addie went with blueberry, which added interest and moisture. Robert's apple-walnut cake was "spectacular." Forkfuls got shared around, and faces lit up: this was truly an amazing pancake. Chopped, nearly ground, walnuts thickened the batter, cinnamon-sugar added texture, and slices of sweet, soft apples topped it off. The sandwiches on the menu are not as good a satisfaction-per-dollar value. 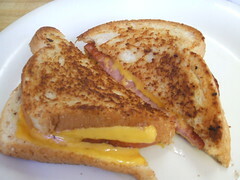 While the ham and cheese ($4.50) was perfectly grilled, with double American cheese and a thick slice of ham, sitting on its own in the middle of a huge plate it looked as sad as the Fair Oaks steak sandwich. (Fair Oaks and Willalby's used to be under the same management, according to Dave, and some things have changed for the better recently.) 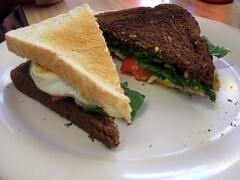 There are ways to get a really amazing breakfast sandwich here, but it's not our place to blab them. Simpler plates like scrambled eggs, eggs over easy, bacon, crispy corned beef hash (maaay-be from a can, but done well), whole wheat and raisin toast all met diner expectations. The French toast was as tasty as advertised with lots of cinnamon sugar and syrup absorption that lead to two resyrupings. These were yum on the bun. The huevos rancheros were probably the most filling, balanced and lunch-like of meals. 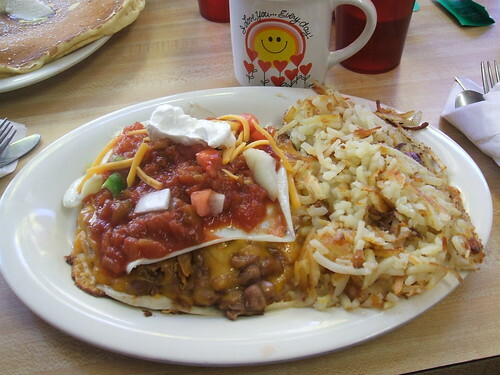 They had the "perfect combination of crunchy tortilla and gooey cheese," quoth Darby, and they were photogenic, too, with a fluffy-crisp mound of hash browns on the side, plus fresh salsa and nutritious beans. The mugs are thrift-store eclectic and hold good strong coffee or one of many teas. Livi dug the DIY chai. We'd love to go back to Willalby's. *Story time. Of all the pancakes Nichole's eaten in the last 20 years, none but Willalby's ever tasted quite like the ones at "Louie's" (formally, the Hampton Cafe) in Milwaukee. One night a week for two years in high school, she taught five straight hours of beginner's violin lessons at Kemtone Music across the street, which was... OK, it was a dump. But the owner was a fair, hardworking Texas businessman and bluegrass banjo player, the place was generally clean and smelled of rosin and pomade, and among the teachers there was a feeling of steady camaraderie. To prepare for ten consecutive sessions of "Twinkle Twinkle Little Star" and variations, Nichole would get off the yellow bus and head to Louie's for a short stack and coffee. Louie's was also a dump. Smoke and grease hung in the air. The dark paneled walls were decorated with fake flowers and unsalvageable instruments from Kemtone. Louie often shuffled over the chipped floor tiles through the long, narrow dining room to pat regulars on the shoulder. He never said much. The pancakes had a certain smooth, bready texture, not mealy but not spongy. From week to week, they would come out more and more orange, and then suddenly one week the batter would be light yellow again. The bill was always $2 and Nichole would leave a fifty-cent piece for a tip, which to this day causes her shame. She should have left more. Or at least regular money. But Louie's is closed now, and the waitresses that always smiled and called her "hon" are long gone. What on earth is wrong with a fifty-cent piece tip on a $2 bill? That is actually pretty generous.